During World War II, Canada's War Department asked the Douglas Hospital to create an army research unit, to study the effects of storage on blood intended for use in transfusions on the battlefield. This was the first scientifically controlled research conducted at the Hospital.
" Untangling the Mind : The Legacy of Heinz Lehmann " documentary on the website of Telefilm Canada. In 1923, we became the first Canadian hospital to use the drug tryparsamide to treat patients with a fatal form of brain damage caused by syphilis. Of the 41 cases treated, 7 died and 21 improved significantly. In 1925, the Hospital became the first in Quebec to use a new approach to the syphilis-based problem— injecting patients with blood infected by malaria. The infected blood gave patients a high fever, which killed the bacteria responsible for the brain damage. The malaria was then treated with quinine. This treatment was developed in 1919 by the Austrian neurologist and psychiatrist W.J. Warner-Jauregg, and earned him the 1927 Nobel Prize in Medicine. Once the Douglas staff were sure of the treatment's effectiveness, the Hospital became a centre for distributing malariainfected blood throughout Canada and the United States. George Reed, MD, who joined the Hospital in 1927, described the procedure: “Verdun Hospital did a unique thing. The malaria had to be a very special type that needed to be maintained from one patient to another. [Our Hospital] was a centre. We would send the blood all over Canada and down to the States. We did it by taking the blood from the patient during the malaria, putting it in an inside pocket, driving to the airport, [and] giving it to the pilot, who would put it inside his shirt pocket. The staff also used the drug somnifene. Known as "twilight sleep" or "sleep treatment", it placed agitated patients in a long-term state of drowsiness. Unfortunately, it made them more susceptible to pneumonia, which was often fatal before the discovery of antibiotics. In 1934 and 1935, the Douglas staff performed cerebral biopsies. In contrast to lobotomies, which were used as treatments at the Douglas in the 1950s, cerebral biopsies were for diagnosis only, for patients thought to have schizophrenia. The operation, which involved removing a small portion of the brain, was not effective and was discontinued. 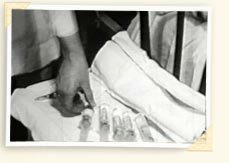 In 1937, we began insulin coma treatment for some of the Douglas patients with schizophrenia. Patients were placed in a deep coma using high doses of insulin. They were then wakened by injecting them intravenously with glucose— or by tube feeding them a sweet eggnog designed to return blood sugar to normal. Recovery rates for patients, who had just begun to show schizophrenic symptoms, ran as high as 80 percent. Unfortunately, many patients relapsed after a year or two, and the treatment was not effective for long-term sufferers. From 1938 to 39, the Douglas staff tried the drug metrazol. It caused convulsions, which seemed to help some patients, primarily those with severe depression. But the convulsions could be severe, causing serious fractures. With the new electoconvulsive therapy or “electroshock” machines, the staff were able to keep patient convulsions within a restricted range, thus protecting patients from injury. Today’s electroconvulsive therapy is vastly superior to that given with the early machines. Now patients receive the smallest dose possible, and patients receive a light anaesthesia prior to treatment, plus a muscle relaxant. Safe and effective, it is used mainly for patients with severe anxiety or depression that does not respond well to medication. In 1953, Heinz Lehmann, MD, tested to see what would happen if a group of severely disturbed female patients were given intensive attention by skilled staff. They responded positively, becoming happier and better able to socialize, all without the use of electroconvulsive therapy or medication. However, this level of attention could not be sustained with existing staff numbers and the patients returned to their previous condition as soon as the project ended. The film Untangling the Mind: The Legacy of Heinz Lehmann shows film footage of the experiment and Heinz Lehmann’s determination to unlock the mysteries of mental illness.